The new thermal compressed air meter is distinguished as a real all-rounder. It does not only have an integrated temperature sensor but it also features a pressure sensor, allowing the user to read four process values at once (volumetric flow, pressure, temperature and totaliser = total quantity meter) and optimise the production. Integration of several measuring parameters in just one sensor does not only save considerable hardware costs (pressure sensor, temperature sensor, wiring and input cards) but also installation and maintenance costs. Integration of the SD compressed air meter into the maintenance unit of existing or new installations provides additional advantages. Now the process values of compressed air in industrial use can be effectively monitored in common compressed air networks via the integrated TFT display. Four different selectable graphic layouts are available. The process values can also be transmitted via IO-Link. 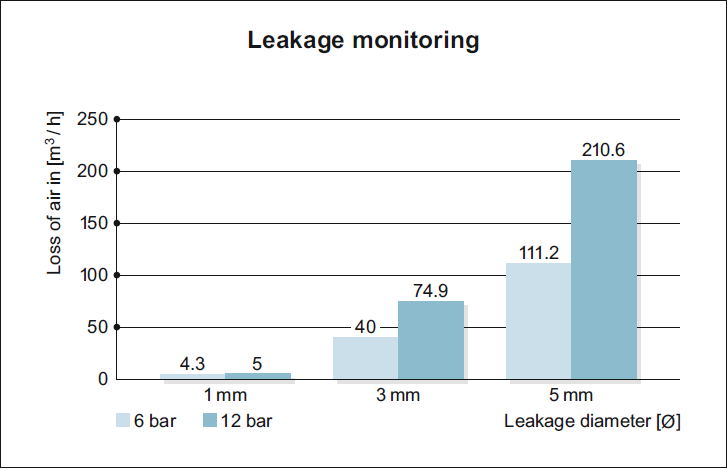 The SD's precise flow monitoring allows for leakage detection and energy cost savings. In addition, the unit's high repeatability enables exact allocation of the costs of compressed air to the respective production line as well as optimised product cost calculation. 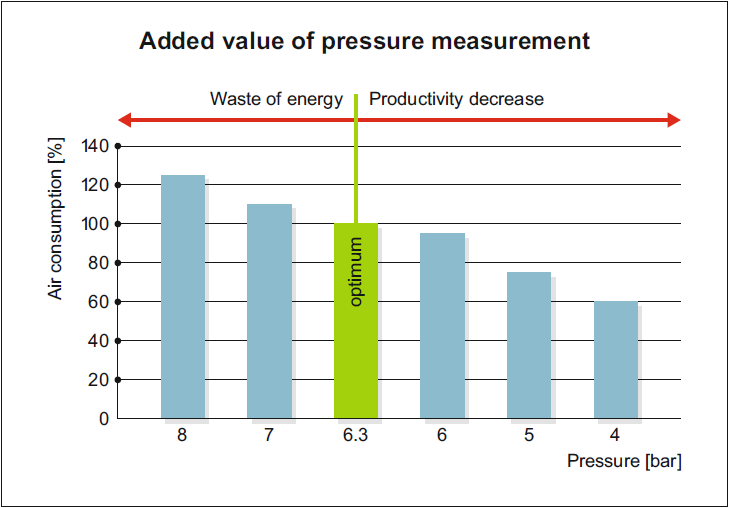 Thanks to the integrated pressure measurement, both the pressure drop on the polluted filter systems and the compressed air system's general operating pressure can be optimally monitored, which is quite important because if the installation comprises actuators that are operated at 5 bar instead of the ideal 6.3 bar, load speed is already reduced by 25%, with productivity decreasing. On the other hand, an excessive operating pressure does not increase the performance but generates increased consumption of compressed air and increased wear of the unit. Thanks to the integrated temperature measurement it is possible to monitor temperature-prone processes such as drying and to ensure production quality. The SD compressed air meter thus increases process reliability. Following the EU directive on energy efficiency DIN EN ISO 50001, all member states have undertaken to achieve energy savings. The requirement for obtaining energy tax reductions is the implementation of an energy management system. The standard requires records on measurement equipment calibration to ensure correctness and repeatability of the measured data. Combining the new SD compressed air meter with regular DAkkS calibrations provides the optimum basis for a reliable energy management system. Applies to the specified article(s) and must be requested when ordering the sensor. Subsequent orders are only possible if the device is returned. The LR DEVICE software ensures quick and easy parameter setting by means of IO-Link masters. It provides a clearly structured interface for online or offline parameter setting of the new thermal compressed air meter. Existing parameter sets can be transferred to further devices. This reduces the time needed for installation.